And what does it have to do with Brigitte? Just when the Overwatch community thought they’d figured things out, Blizzard throws another cryptic teaser to the masses. The Overwatch Twitter account posted another weapon sketch, this time a shield with a lion’s face—something that wouldn’t look out of place on Reinhardt. As with the first teaser, the drawing’s notes are written in Swedish, with a ginger cat appearing in frame. If this is a teaser for Brigitte, we know two things about her kit: She’ll hold a shield and a hammer-like melee weapon. But under the shield sketch, there’s a smaller drawing right near the coffee rings. It looks like a tail—just like the ginger cat tail in-frame. Overwatch fans are immediately calling this design jetpack cat, a callback to an older hero design that was scrapped before the game’s release. None of these tweets are an explicit confirmation of Brigitte as the next Overwatch hero, but all the hints add up. The Overwatch Twitter account posted a declassified briefing on Feb. 22 that detailed a mission where Reinhardt saved Torbjörn’s life. The next piece of information was a letter from Torbjörn to his wife Ingrid, where Torbjörn said Reinhardt will become his unborn daughter’s (presumably Brigitte) godfather. 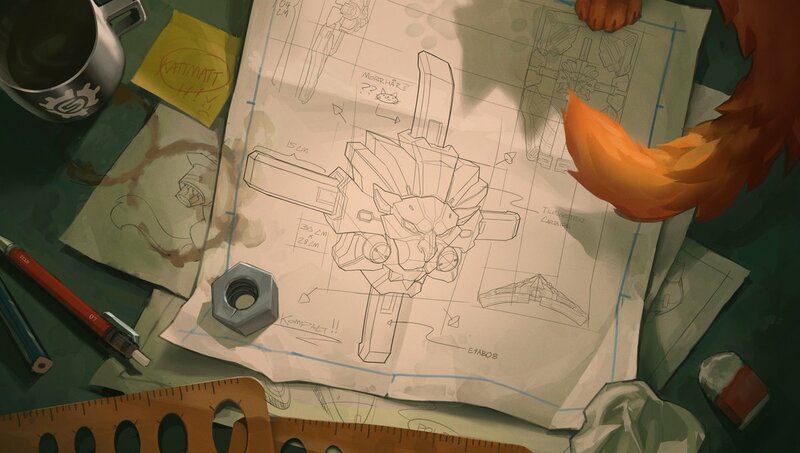 So is jetpack cat a part of Brigitte’s kit? It feels like Blizzard is gearing up for a reveal, so we’ll know soon enough.